The usual factors will need to be in place, like a healthy roster, steady goaltending and clutch goal scoring. 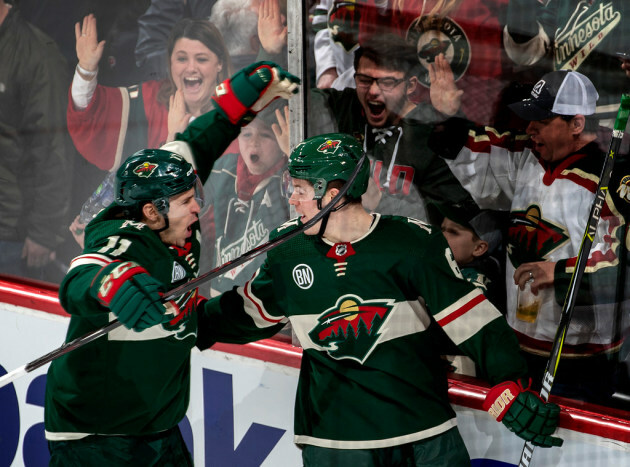 But what could also boost the Wild in its final 10-game push for a playoff spot is improved special-teams play, a lift that seems possible after the power play delivered in a 5-2 win over the Rangers Saturday at Xcel Energy Center to snap the team’s three-game losing streak. The penalty killers did their job, snuffing out two looks for New York, and the power play converted on one of its three chances – a one-timer from defenseman Jared Spurgeon in the third period. It was the second power play goal for the team in two games since it focused on playing with the man advantage at practice Wednesday, a much-needed session according to Boudreau and the players. A scary scene happened in the second period when winger Jason Zucker went down after New York defenseman Brady Skjei fell on Zucker’s right leg, twisting it awkwardly. Zucker appeared to be in visible pain on the ice and had to be helped off, gingerly moving to the dressing room without putting any weight on his right leg. But he returned a short while later and finished the game with an assist, four shots and 14 minutes, 21 seconds of ice time. Zucker was unavailable after the game. Perhaps the most encouraging stat from the Wild’s performance was its 75 shot attempts, 46 of which landed on frame to tie for its second-highest output this season. It won’t be long before the Wild will try to duplicate an effort like this. The team is back in action Sunday when its five-game homestand continues against the other team from New York, the Islanders. Who will start in net is unclear, as Boudreau said he wasn’t sure yet when asked after the game. It’ll resume play only two points back of the Coyotes for the second wild card spot in the Western Conference, moving a point closer after its win and an overtime loss for Arizona to the Edmonton Oilers.